All trust was gone. In its wake was only betrayal and fear. Her death would come anyway. This was a fact she’d been living with for nearly three years and something that could not be avoided. But once the safe was opened, there would be no recourse. No way of saving her daughter and granddaughter. “Kill me,” she said, grateful her daughter had already visited today and was now safely at home. “I’m as good as dead.” Chemotherapy and radiation had done nothing to save her. The oncologist had tried numerous medications and they hadn’t worked. She didn’t want to die, but she didn’t want to live chained to a bed, her body a shell of what it had once been. And according to her oncologist, that was exactly how she would be in the next few months. Terror had her heart tripping out of beat as she tried to remember the combination to the safe. The crying became louder, stronger. As if the baby was in the room. As if her granddaughter demanded that she not obey. “What about my other daughter?” she asked. Between the murky dark shadows fogging her head and the sudden buzz in her ears, she tried desperately to picture the beautiful, vibrant woman. She didn’t believe the whispered promise. Not with a gun pointed at her head, and the threats still hanging in the air like an ominous thundercloud. She closed her eyes. Tears slid down her face. “Eight, five, nine, ” she began, the baby’s cries growing louder. She shook her head hoping the cries would stop, so she could remember the combination before she slipped into that sweet place where there was no pain. As she tried to think, she swore a cascade of water gushed from somewhere in the room. There were no faucets in the office, though. Maybe the water had been left running in the adjoining bathroom? Maybe she wouldn’t die from an overdose or gunshot, but from drowning. Panicking, her gaze settled on the gun. She sobbed and pictured her longtime companion and best friend, her eyes lifeless, a bullet hole in the center of her forehead. Sickened, she looked at the safe. Her secret wasn’t worth her daughter, granddaughter or Ann’s lives, and no amount of money was worth dying for with the guilt of their deaths blackening her soul. As she finished giving the last digits of the combination, she wished to God she had left the past where it had belonged. But the daughter who had been lost to her, her smile and eyes so much like her own, filled her mind and heart with love. She would die today, but at least she would die knowing she’d done right by her child. The doorbell rang again. The cascading water started to sound more like a torrential downpour. And the baby’s cries…she needed to be with her. In the dark recess of her mind, she needed to go to her. Hold her. Kiss her. The baby’s cries pierced her ears, just as a needle pierced her arm. As the drug rushed through her veins, something pulled her. Tugged at her psyche. Her mind fell into a familiar tunnel, spiraled and pitched from side to side. Quick movements and bright lights had her blinking rapidly. The baby’s cries sharpened and her skin prickled with dread as the room came into focus. Sucking in a deep breath, her heart and head pounding, Celeste Kain looked down at the crocheted blanket she clutched in her hand. With record speed she had Olivia out of the highchair and held tight to her chest. She rubbed her daughter’s back and rocked her. As she soothed her little girl, the kitchen sink captured her attention. The large pot she’d been filling with water overflowed. Steam clung to the window where droplets of condensation ran in streaks. She rushed to the sink and shut off the faucet, then looked to the stove. The glass top burner was red-hot and waiting for the pot of water. She shut off the burner, too, all the while chastising herself for stupidly turning it on in the first place. Her cell phone rang. She jumped and held Olivia tighter. Although her baby girl’s cries had subsided, the heat radiating from her little body told her she’d been screaming her head off for quite some time. How long? She glanced at the clock. Ten? Fifteen minutes? Confused, her mind racing in a million directions and filled with so many unfamiliar and terrifying images, she kissed Olivia’s head and ignored the phone. She didn’t know what had just transpired, but she had a terrifying suspicion that the dead were talking to her—again. God, she needed a moment to digest, to remember what she’d been doing before…whatever had happened. She hugged her daughter tighter. Had she slipped into a trance? She must have. But that hadn’t happened since Wisconsin. Grizzly images of murdered women ran front and center in her mind. She quickly dispelled them and rested her chin on Olivia’s head. This couldn’t be happening again. Not now. She was in a good place. Stress free. In love with her husband, her beautiful daughter and happy with the successful bakery she owned. She kissed her daughter’s head again, and held back a sob when Olivia hiccupped. How long had her poor baby been crying? What if Olivia had choked on the Cheerios on her tray? What if she hadn’t been in her highchair and had been toddling around the kitchen? The burner had been on and Olivia could have reached up and burned herself. “Sorry. Olivia’s fine. It’s just…” How did she tell him? God, how did she keep this from her husband? John worked for her dad’s private criminal investigative agency, CORE. While she trusted that her father wouldn’t say anything to her husband, it would hurt John to know that she’d confided in Ian before him. Then again, John hated her psychic stuff. As for Ian, he’d been the one who had encouraged her to come work for him and use her abilities to benefit his company. Only she hadn’t had a single vision in over two years. “I had a vision,” she admitted. Now that Olivia had calmed down and was squirming in her arms to reach a toy on the floor, she sat her daughter on the hardwood. She ran a trembling hand through her hair until it became tangled in her curls. Snippets, like a quick movie trailer, filtered through her head. A room, cast in the golden glow of a lamp. The mahogany wainscoting on the walls. The pretty floral wallpaper above it. The antiseptic scent. The barrel of a gun. A safe. The pierce of a needle. No. She would not go there. “Don’t you dare go there,” she said, her temper flaring. “I told you before, I won’t work for CORE.” After Wisconsin, after witnessing the results of her visions, she wanted nothing to do with murder investigations. Yes, she did. She also knew her dad was manipulating her. But she’d take the bait. She needed to learn how to control her visions. She had a household and business to run. She and John had been talking about having another baby—arguing really. He’d refused to bring another child into the world until she’d hired more help at the bakery. Hiring a manager was easy enough. Except she had control issues. Right now, she couldn’t control her gift. If John found out she was having visions again he’d definitely nix having another child, even if she hired a manager. He might believe in her, but he had always hated what he’d referred to as her psychic stuff. 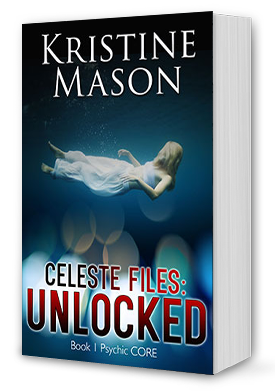 At the time Ian had offered her assistance, Celeste had been too busy recovering from the injuries she’d sustained at the hands of a killer, moving in with John and starting her bakery, the Sugar Shack, to even consider meeting with her dad’s psychic acquaintance. The visions had stopped anyway. Marrying John, becoming pregnant with Olivia, the bakery…she’d been so involved with life’s ups and downs that she hadn’t missed or cared about being psychic. Until Ian and his fiancée had been kidnapped two months ago. Then she had desperately tried to gain a reading to help find them, but had been unable. She’d figured she had lost her ability—and was dead wrong. “Yes?” she asked, and picked up Olivia, who smelled ripe.